I do love using stamps to make give the look of DSP. I know I have had a recent infatuation for with real DSP recently but I think my heart still belongs to my hand stamped versions. 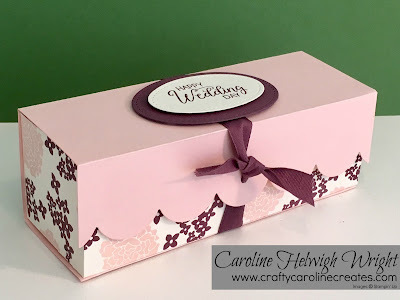 For this box I have used two of the lovely images from Beautiful Bouquet stamped on Very Vanilla card stock. 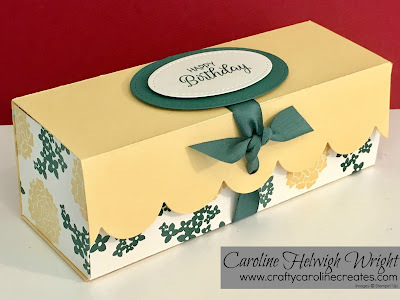 I love the scalloped edge on the lid - this looks so pretty and is so easy to make using one of the dies in the Seasonal Layers Framelits. 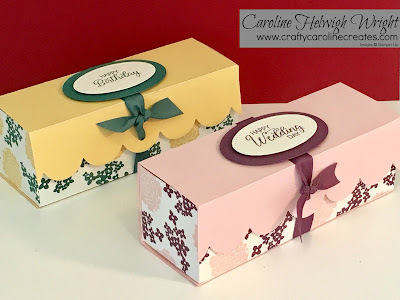 The sentiment is also from Beautiful Bouquet - this is a really great all round set. I have popped it up using my constant favourite Stitched Shapes Framelit dies. My colour combinations? Powder Pink with Fresh Fig and So Saffron with Tempting Tide. Which do you prefer? You can take a closer look and see just how easy this box is to make by clicking HERE.